The Ragdoll breed of cat is also known as Cherubim and Ragamuffins. These cats are very quiet, relaxed and have an easy going disposition. The reason they are called the Ragdoll cat breed is because when you pick them up, they tend to stay floppy and limp, similar to a ragdoll. 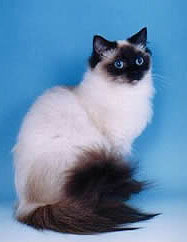 Ragdoll breed of cat is of three different types, which are mitted, bicolour and colour pointed. Most ragdoll cat breeds are colour pointed, which means the fur of their body is of a lighter shade than the fur at the points of the body, which are their face, ears, legs and tail. Ragdoll cats mature very slowly, and they grow their full coat of fur and establish its permanent colour at about two years of age. At four years, it reaches its full size and weight. 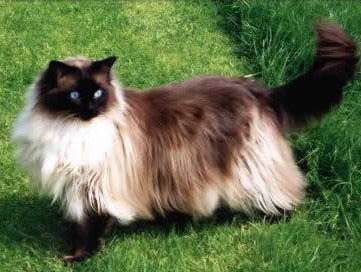 Ragdoll cats tend to be large, and have somewhat long hair. Their heads are usually broad and they have wide eyes. Their paws are large and round, and they have long, bushy tails. They have a thick, silky coat. Many of them have striking blue eyes. Ragdolls are very quite animals and often prefer a calm environment. They have soft voices but you will find that they purr surprisingly loudly. Those with semi long hair need little maintenance, but you do need to brush their hair at least once a week to prevent hairballs. Ragdoll cats are a very popular breed of cats as they have a very beautiful appearance, and tend to be very loyal, trusting and affectionate. They are very friendly and docile so they get along with not only their owners and their favorite people, but can also be quite friendly to house guests. Ragdolls enjoy being held and carried and are at their best when spending time with their owners. I want to own this breed of cat, but I don’t know where to get this.. Here in the Philippines this cat is quite unfamiliar,most cats here are domestic, siamese and persian breed.. How I wish I could own this too, but do you think they can get along easily with other breeds? Yes the ragdoll will get along so well with other pets in the house or people that often you have to be the one to protect him or her from harm.Because they will not defend theirselves. I breed ragdolls in the states but would never ship anything living.To me my pets are precious family members. I am having a hard time distinguishing my cat from a long haired siamese or a ragdoll. She acts more like a siamese but has more physical characteristics of a ragdoll. What do you mean they wont defend themselves? Where can I buy one of these cats in South Carolina? old. Where in South Africa can I buy one ! I’m getting a rag doll cat for me and me only i can’t wait ! Just to balance the praise — worthy though it no doubt often is — with an alternative experience, I have a male ragdoll cat whose just under 1 year old. He does not like to be held, is never willing to sit on my lap, and spends most of his time bullying my two female shelter cats. I spent over $500.00 hoping to get an affectionate cat and what I got is an over-sized meanie. He does go limp when I pick him up, for a little while anyway, but then struggles to be free. of them all and ‘usually’ is the aggressor. Great cat. I would not introduce a new pet in my home due to her personality. She is outrageously insecure, possessive of me and growling like a dog when another animal is within earshot tells me she would not do well (neither would the other animal) if she had to live with another animal, or even person as I am a young senior living alone and she sometimes barely tolerates me. There was a time I thought she was psychotic and I haven’t ruled out the possibility that as she gets older, she might get worst, but time will tell. Just because the cat is a Ragdoll, it doesn’t assure you that each of them are wonderful. Mine has a pedigree a mile long and came from a reputable breeder in Navan, Ontario. I have,( I think), I am told a ragdoll. I had him since he was 6 weeks, My problem is I was living with my son and his family and they surprised me with him. They then obtained a puppy. Well, they both grew up together, they slept together and we let them out in the backyard together almost everyday. I moved and took him with me and now he wants to go out everyday. i believe he thinks he is a dog. I don’t have a yard so I bought a harness and I started walking him. He is very talkative and he also was used to getting up at 5am with my sons family. I am a senior and I need my rest He bites everything, he knocks over anything on shelves, dressers, tables etc. just to get my attention. I am at my wits end. I moved to NC from NY almost a year ago and all my other cats never upset me as this one does. I love him but I need my rest. anyone have any ideas as to what I should do? I love Ragdolls, have ever since I first read about them. I am definitely getting one for my first cat. However, I do want to put in a correction to the description at the beginning of the page – Ragdolls are not Ragamuffins. Ragamuffins are actually a separate breed. They are very similar though, the only difference really being the fact that Ragamuffins come in any colour combo except points, and Ragdolls are just pointed with no other colour patterns. I have 2 male 7 year old rag dolls (not from the same litter) and they have been around children and a visiting sheltie since they were kittens. Jaspers very vocal and quite shy and will disappear when strangers visit. He is affectionate but not overly and will only really sit next to me for stroking he purrs loudly too, he’s not very playful and you have to encourage him. Neo is very different he follows you everywhere,even bathroom,scratching at doors to get your attention.he’s not shy with guests, he’ll sit next to you for hours.his favourite game is fetch with hair bands which he’ll play for ages. When I’m getting ready in th mornings he’ll lie on my bed doing that thing with his paws purrs and meowing to me. I love them both dearly the way they are and would not change anything even all the fur everywhere. I have a raggie and he loves everyone and any attention but especially attatched to me, he was adopted so I wanted him to have some company when I was working so I adopted a desexed persian cross female and that seemed to work. I think your raggie is missing his or her friend so is acting up, you may need to get another cat for company. Buddy Lambert the blue point ragdoll came to us from the woods as a poorly socialized feral juvenile, covered head to toe in dreadlocks and addicted to scratching and biting everyone and everything in sight. Over a year of attentive care and loving training and now he is greatly improving with many typical ragdoll behaviors beginning to show, but he still won’t sit on my lap without getting into a plastic bin for protection first, and like other posters, he goes limo when picked up but quickly begins to struggle if held or carried for any length of time. That being said, he’s so impossibly cute that I couldn’t imagine letting him go even if he stayed standoffish, but now he’s getting cuddlier every day, so there is hope folks! Respecting his space, not picking him up very often, getting on the floor with him regularly and buying him an extra late super heavy duty cat tree to give him more sense of security seems to be helping greatly. And he does pay play fetch. Is there a good age to buy when we could tell its personality? I’m single quasi-retired, travel 2/3 days at a time. No other pets. Occasional guests. Roomed for 11 years with a female, Russian Blue, who was laid back and friendly, No problems. She may have been a mix, as she was 18 lbs. Wanted a similar different breed.